Barack Obama, the US president, has landed in Ethiopia, beginning a two-day stay and becoming the first American leader to visit Africa’s second most populous nation. The president’s jet touched down at Addis Ababa’s international airport on Sunday after a short flight north from the Kenyan capital Nairobi, and he was greeted on the tarmac by Ethiopian Prime Minister Hailemariam Desalegn. The visit will include talks with the Ethiopian government, a key strategic ally but criticised for its record on democracy and human rights. Obama will also become the first US president to address the African Union, the 54-member continental bloc, at its Chinese-built headquarters. He will also hold talks with regional leaders on the civil war in South Sudan. AU Commission chief Nkosazana Dlamini-Zuma hailed what she said will be an “historic visit” and a “concrete step to broaden and deepen the relationship between the AU and the US”. 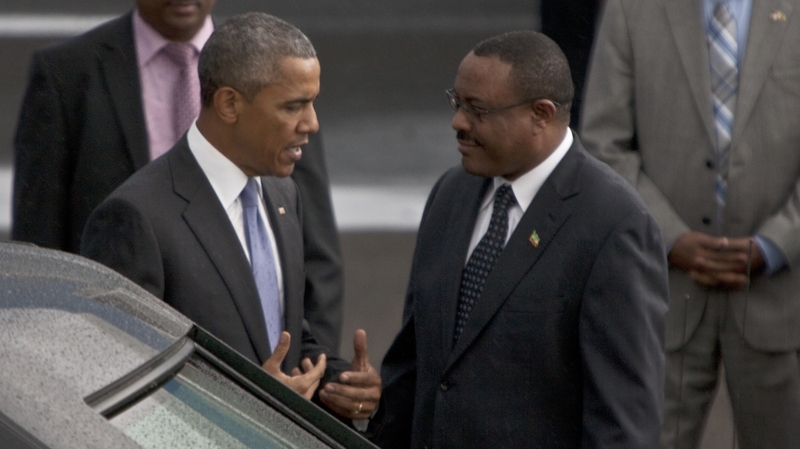 While Obama was greeted by cheering crowds in Kenya, Ethiopians have shown less enthusiasm over his visit. Ethiopia’s government won 100 percent of parliamentary seats in a recent disputed election. Rights groups have called on Obama to publicly meet democracy activists on the ground and have a launched a hashtag on Twitter, #EthiopiansMessageToObama, posting pictures of torture and allegations of abuses. Al Jazeera’s Mohammed Adow, reporting from Addis Ababa, said Obama is expected to put pressure on authorities to reform and tackle their dismal human rights record. “Authorities will in turn be eager to deflect attention towards the country’s record of growth and poverty reduction as well as increased security cooperation with the United States,” he said.